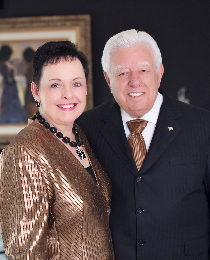 As highly-respected civic leaders and longtime members of the Chapman University family, S. Paul and Marybelle Musco have supported the university’s mission in a broad range of profound ways. Their tireless fundraising efforts as co-chairs of the American Celebration Gala helped raise nearly $8 million in scholarship funds. The couple has also endowed the Sebastian Paul and Marybelle Musco Chair in Italian Studies to advance the study of the Italian language and heritage. This is a major asset to many University programs, including Opera Chapman, where it helps to prepare Chapman’s best singers to audition for stages and performances around the world, including the Metropolitan Opera House, San Francisco Opera, and Operafestival di Roma. The Muscos’ institution-building efforts on behalf of opera in Southern California are legendary. Their tremendous support of Opera Pacific, Los Angeles Opera, Opera Chapman and the Opera & Choral Conservatory at the Orange County School of the Arts has had profound effects on opera in Orange County and Los Angeles. Marybelle and Paul currently serve as co-chairs of the Orange County School of the Arts’ $20 million Masterpiece in the Making capital campaign to raise funds for the completion of its campus. Paul is also a community partner on the advisory board, and the school has named the Marybelle Musco Dance Center to recognize their major capital contribution and hands-on involvement with this comprehensive campaign. The Muscos’ philanthropic work has resounded through a great many organizations that include Canyon Acres Children and Family Services, the Cystic Fibrosis Foundation, the Muscular Dystrophy Association, the UC Irvine Diabetes Center, PBS SoCaL and the Orange County Sheriff Advisory Council. They are active advocates for nursing education, and Paul is a regent at Brandman University, where the couple has contributed major funding to support and name the Marybelle and S. Paul Musco School of Nursing and Health Professions.